When creating a drop-down list in Excel, it takes a range of cells as input and shows it as a list. There is not much you can do with how your list looks in the drop down. For example, you can not give a background color or change font color, font type, font size, etc. Display main category and sub-category in a drop down list in Excel. Disguise numbers as text in a drop down list. In this tutorial, I will show you how to show symbols in drop down lists in Excel. Select a cell (let’s say A1). Go to Insert –> Symbols –> Symbol. 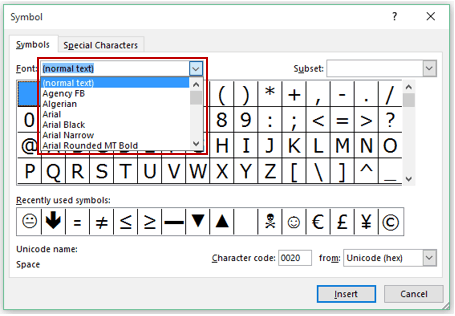 In the Symbol dialog box, select the font from the drop down. An excel drop-down list displays the content in Tahoma font (info credit: Debra Dalgleish). Any symbol you use from Tahoma font also usually works with other regularly used fonts such as Arial, Calibri, Trebuchet MS, Verdana, etc. However, you should test this in case you are using symbols from other fonts. In the Symbol dialog box, select the symbol you want to insert and click on Insert. This inserts the selected symbol in the cell. 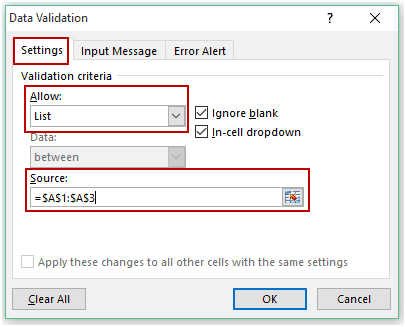 Select another cell to insert another symbol. Now we can use these symbols in cells (as shown above in the pic) to create a drop down list. Select the cell where you want to create the drop down list. Go to Data –> Data Tools –> Data Validation. In the Settings tab, select List from the drop down. In the source field, select the range of cells that you want in the drop down list. That’s it. It will now show the drop down icon when you select the cell. Click on the downward pointing arrow icon to show the drop down list (as shown below). You can use only symbols in the drop down list or you can combine symbols and text. Here are some examples of some common symbols that can be used. Upward and Downward arrows to show increase/decrease. You can also combine symbol and text and show it in the drop down list. You can replace the word ‘Increasing’ with any text or cell reference. Here are some examples to show how this combination of text and symbols can be used in the drop downs. Upward and Downward arrows with text. Using Bullets (to show main category and sub-category). Press Alt + 7 or Alt + 9 from your numeric keypad. To get the indentation, as shown above, simply use the space character. In this tutorial, I have shown some of the examples of how you can use symbols in a drop down lists in Excel. I would love to know how you use it in your work. 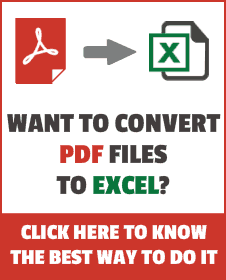 How to Insert Cent Symbol in Excel. Hello Sumit. This is Awesome, however is there a way to make the symbols with colors? I mean I have tried to use the “circle” symbol and I have colored it the same way as what we have in a stoplight, but when I use it for data validation, the color is not showing. Use conditional formatting to test the cell that gets filled in with the drop down symbol. So let’s say you have an Up arrow, you can use conditional formatting to format the cell automatically Green when the Up arrow is selected. This formatting won’t be visible on the drop down but will be visible once selected. Plenty of tutorials out there for more details.